We've got another new feature for our Automation plan, which (staying true to the name) is a huge time-saving automation! Instead of manually adding supplier invoices, painstakingly adding each line item, unit cost, and nominal code, you can now simply drag and drop the PDF into Commusoft and we'll do the rest. It really is as easy that. Once the supplier invoice is automatically imported a few moments later, you'll get a notification, letting you know that it's ready. 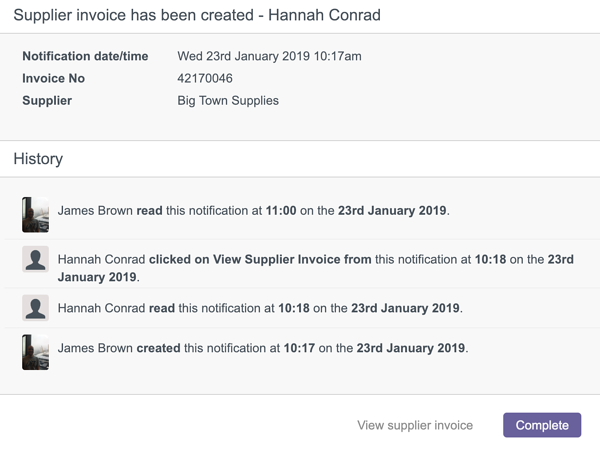 If your office staff are having to manually add supplier invoices into your job management system, this could save hours of tedious work - and reduce potential mistakes. Please bear in mind that this feature is only available on the Automation plan and above. If you're not on this plan, book a meeting or call the team on 0203 0266 266 about upgrading today. The old process of adding a supplier invoice meant you had to go to the Supplier page, click 'Add supplier invoice', then meticulously type out every detail. Let's face it, mistakes happen. Even small mistakes (like putting a decimal point in the wrong place) could result in frustrating accounting discrepancies and other issues down the line. With automated supplier invoice import, simply head over to the corresponding supplier and drag the PDF invoice into Commusoft. You'll see the little animation below letting you know you can release the document. The system is fantastic at reading, so unlike tired office staff, it won't make an error. Tip: You can upload multiple PDFs in one go against the same supplier, simply drag a batch of PDFs into Commusoft. Or if one PDF document has multiple invoices within it (with different invoice numbers), it will identify and create a supplier invoice for each. Once you release the file, it will upload to Commusoft and begin to extract the information from the document (the tech term for this is parsing). You can leave the page now and Commusoft will continue working in the background - you'll receive a notification when the import is completed, which should only take a few minutes. Once complete, you will have a new invoice logged against the supplier, however, the system has done all the hard work for you. The newly generated invoice operates just like your other supplier invoices and you can edit any part of it if needed. If the invoice has a purchase order number that matches a PO number in Commusoft, the system will recognise it and link the two together. Commusoft will also upload the original PDF to the attached files section of the supplier page. This ensures that you keep a record of the original document alongside the supplier, should you ever need to access it. Tip: You can also import supplier invoices from the 'Costs' tab of a job. If you choose to do this, you will be asked to select which supplier the invoice is from, we'll then take it from there! What if there are mistakes in the invoice? If there are mistakes in the PDF received from the supplier, such as the total not matching the line items, you will receive a notification of the issue by email. In most cases, the system will still create the invoice record in Commusoft, allowing you to simply make the required edit to rectify any problems. We'll attach the PDF document to the email as well, so it is clear which supplier invoice the issue is relating too. Is there a supplier you use that is missing from this list? If you are interested in the automation plan and this feature, we can add more supplier templates as requested, without any charge. Bear in mind that you can only upload PDF invoices received directly from these suppliers. Modified documents, scans, or photos of invoices won't be able to be read properly. If your supplier only send you paper copies of invoices, you may be able to request that they also send a digital copy by email. The file size can't exceed 5MB, however, from our experience this shouldn't be an issue. There is very little to set up to get started with this automation. Make sure your supplier has the correct invoice template assigned to it. To do this go to the Supplier screen and click 'Edit supplier'. You will be able to select an invoice template from the dropdown list, which needs to match the type of PDF invoice you receive from them. If you receive 'Wolseley' invoices, but the supplier is set to 'Plumbase', the system won't be able to read the PDF. From the 'Edit supplier' screen, you will also need to set a default nominal code for the supplier, if you haven't already. When a supplier invoice is automatically imported, it will need to assign the items to one specific nominal code. If you have an invoice that has line items with different nominal codes, you would need edit this manually once it has been imported. Whilst this would take a few moments to adjust the nominal codes, you have still saved significant time thanks to the automated process. That's all that requires setting up to get started. Automated supplier invoice import is only available on our Automation plan, alongside features like shifts and intelligent scheduling. Want to learn more about powerful automations? Our team are happy to discuss the benefits with you - give us a call on 0203 0266 266. Are you happy with the work we're doing? We'd appreciate it if you let us know in a review - we love reading your feedback! You can review our software here.